In June 1849, the foundation stone of a new District Church at Clifford was laid by the Rev. T.W. Webb of Tretire, and in September 1851 the new church was consecrated, being the District Church of the Holy Trinity in the township of Hardwick and parish of Clifford. 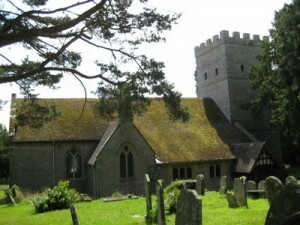 The church was built in hewn stone in the early English decorated style, with beautiful stained glass windows, and could accommodate 150 persons. There was a 62 foot high, richly ornamented bell turret; the west door of the nave was large and deeply moulded with two massive buttresses. Inside the church, the absence of galleries and the high pitched roofs was striking, and the plentiful stained glass was a joy. The seats of the nave were open and made of the best heart of oak adorned with intricate carving, and the font had been beautifully worked by Edwin Hughes. The pulpit was richly moulded and carved in oak, with gothic balusters. The whole of the church was considered to be a glorious work of art.